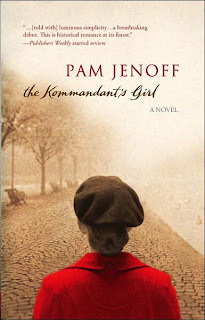 I finished The Kommandant's Girl by Pam Jenoff a couple of weeks ago. It's the story of Emma Bau, a 19-year-old newlywed whose world is destroyed when the Nazis storm into her native Poland. As her fellow Jews disappear around her, Emma's own husband goes into hiding with other Resistance workers. Left on her own, Emma resigns herself to life inside the filthy Jewish Ghetto. One night, however, she is whisked away to Krakow by the Resistance and given a new identity as Anna Lipowski, an unmarried non-Jew. Emma/Anna thinks herself safe living with a relative under an assumed name, but soon her situation becomes more dangerous than ever. It begins with an innocent dinner party, where Anna is introduced to Kommandant Georg Richwalder, second in command of the city's new Nazi government. Anna is distressed to find that the Kommandant seems to be smitten with her. In fact, he insists that she come to work as his personal assistant. Desperate to keep her identity hidden, Anna accepts the job and all the dangers that come with it. While the Resistance urges her to use her position to gather secret information, Anna must confront her own growing feelings for the Kommandant. When he presses her to become intimate, she must make the ultimate choice, between fidelity to her absent spouse and loyalty to her people, a choice made much more complicated by her confused feelings for her employer. This book is mesmerizing for so many reasons, but it really all comes down to the choice Anna must make between keeping her marriage vows and using the Kommandant for the information he can provide. It may seem a clear choice, if it wasn't for her traitorious feelings for the Kommandant. The reader can't help but place herself in Anna's shoes and wonder, what would I do? Thankfully, the choice is moot for us, but for Anna it is all too real. Her decision changes her, her young marriage and, indeed, her life. The Kommandant's Girl is an excellent, fascinating read. If it wasn't for the ambiguous ending, I would give it 5 glowing stars. Still, it's worth picking up for its spare, but rich language and a tightly-woven story that is simply too exciting to put down. My second pick could not have been more different from my first. Not only does Accountable Kids: Raising Accountable Kids One Step at a Time by Scott W. and Traci S. Heaton not employ rich language, but it's not all that exciting. Yet, I found the ideas and information in the book quite compelling. The Heatons book is actually an instruction manual explaining the nuts and bolts of their program which teaches kids how to be responsible for handling chores and money. Basically, each child has a board with pegs on it where they hang cards that represent their jobs (from cleaning their rooms to completing homework to brushing their teeth). When they finish a task, they place the job's card on a new peg, representing its completion. Each night, the child receives a sticker if he/she has done all of his/her jobs for the day. The stickers can then be "cashed in" for a date with mom or dad. Kids can also earn Privilege Passes, which are redeemed for time on the computer or tv or any other "privilege," as well as Bonus Bucks, which translate into real money. Implementing the program will require some work on my part, but I'm excited to see how it works with my kids. It's definitely user-friendly and it promises to deliver important results. The book itself is basic and not really well written, but I think the program itself is genius. 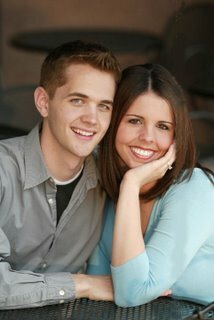 If you want more information, check out http://www.accountablekids.com/ . I also just finished Maeve Binchy's newest, Whitethorn Woods. It's a collection of intertwining stories from a wide cast of characters, all with connections to the small town of Rossmore and its infamous woods. People make their way into the woods for one basic reason - to petition St. Anne at her shrine in the trees. Now, the shrine is being threatened by the proposed construction of a new byway, and the residents of Rossmore all have something to say about it. Here, Binchy does what she does best - delves into the lives of ordinary citizens, making them sparkle with personality and charm. On the way, she unearths Rossmore's secrets, praises its quiet heroes and gives comeuppance to those who deserve it. All of this is set against the juxtaposition of old and new which comes to light because of a crumbling shrine and the new road which threatens its survival. Maeve Binchy has a gift for bringing characters to life and this book is a shining example of her skill. Still, it is sometimes hard to keep track of just whose life is intertwining with whose. Also, because of the many different viewpoints, the book is somewhat disjointed. I liked it, however, and would recommend it to Binchy fans. 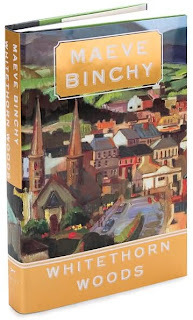 For those who have never read Binchy, I recommend starting with one of her better books, like Circle of Friends or Light a Penny Candle. I found your blod from my cousin. I love to read and am excited to have some new choices. Thanks for the tips! I'm glad you commented - hardly anyone comments on this blog :) Let me know if you have any recommendations - I'm always looking for new books and authors. Happy reading! J - remind me to give you the address to my family blog. That's where I share all the family news, pics and, of course, all the funny things Heather says! I read Life of Pi last year. It was fabulous, although it made me queasy at times. Thanks for the update on Maeve Binchy's latest. One of my favorite authors!